I live in a county in Maryland that makes recycling easy. Maybe too easy. I just fling my recyclables into blue bins for curbside pickup and, shazam, the stuff disappears! 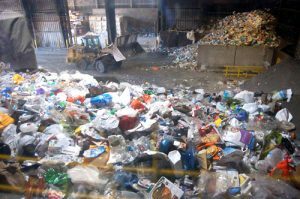 I recently took a tour of our recycling center and got to see firsthand what happens next, and whether I should worry about it. Knowing recycling statistics didn’t prepare me for the sheer volume of materials coming in from affluent Montgomery County. Moving along conveyor belts are the leftovers of our consumption. Workers rapidly sort through the materials. They remove contaminating objects like plastic bags or trash, and separate the remaining recyclables by content. Prior to going into the main room we are offered earplugs as the noise is deafening and constant. Once inside we watch gargantuan machines moving materials in an unending river of plastic, aluminum, steel, glass, paper and cardboard with the occasional rubber boot, electric fan and other outcasts. 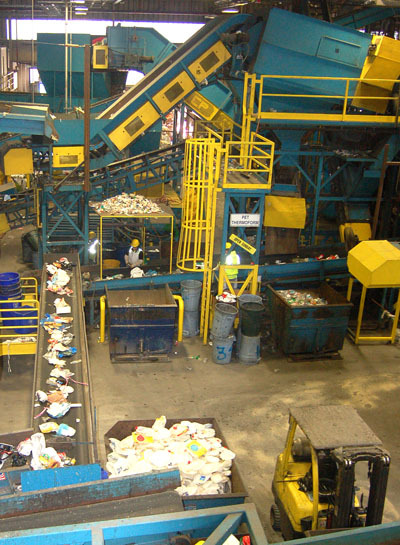 Our county uses a dual stream system that means mixed paper is sorted separately from commingled materials like plastic or cans. This produces “cleaner” materials at the end of the process, which are then sold in bulk to be reused. 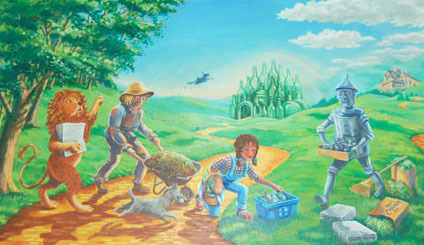 Our county recycling center makes a profit on the materials they sell. In a cavernous room called the Tipping Area, trucks deliver the materials where they are pushed and loaded onto the initial conveyor belt by a huge front-loader. The trucks pour in steadily, one after another. The mountain of material is staggering. 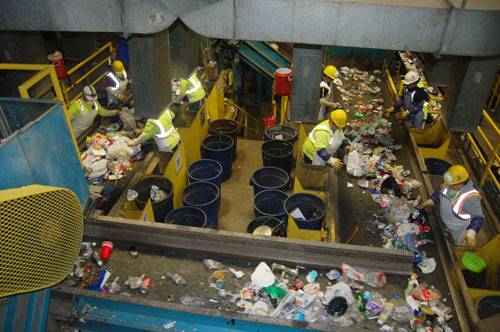 Once on the conveyor belt, what you toss in your recycling bin makes its way through the system. The workers, almost all Latina women, move at a frantic pace in 3 hour shifts, tossing unwanted pieces into specific bins along the belt system and sorting the rest according to content. Watching the process is an unforgettable experience. 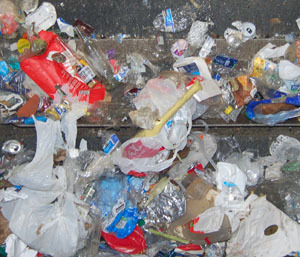 A torrent of plastic water bottles, cans of every description, soda cans, glass bottles, milk cartons, newspaper, cardboard without end. I begin to wonder if we need all this stuff in the first place, even if it is recycled, and how much energy and contribution to climate change comes from the constant arrival of trucks delivering this mountain of post-consumer items. After the tour, the center’s manager talks about the need for consumers to be more aware of what they put in their recycling bins. 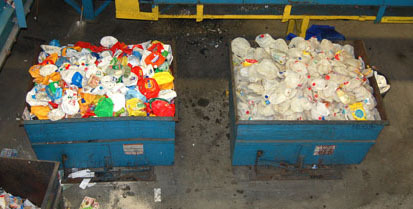 If consumers do a better job of sorting what they toss in their bin, there is less for the recycling center to have to deal with. A little discretion goes a long way. A prime example is plastic bags. These do not belong in the recycling bin because they clog up some of the sorting machinery. I also learn that much of what we may think helps, actually makes it harder. One example is leaving caps on bottles. The center’s manager tells us that since they are made of different materials, it’s better that the cap is not on the bottle. Despite this useful, friendly advice, I cannot help but think we need somehow to end the entire river of recycling that makes it easy for environmentalists like me to buy, use and toss out even a few extra cans or containers. I leave thinking how much better things would be if we all put a little more thought and effort into the common act of recycling. For a first step, we can follow the 4 “R”s. Refuse (don’t buy it), Reduce (use less), Reuse and Recycle. Nevertheless, we need, I think, additional steps to reduce our overall energy use, prevent climate change, and get rid of endless landfills and incinerators. If we are to reduce and someday end the long line of trucks waiting to dump mountains of consumer stuff from my home and yours into massive recycling centers, we will need to take broader action. Montgomery County has a Styrofoam ban, but the entire state of Maryland does not yet. Groups like the Rachel Carson Council, if you sign up, will send you action items that are easy to use online. Take Action The Maryland legislature will vote soon on banning Styrofoam. If the ban passes, and is signed by the Governor, citizens in Maryland won’t be able to buy things packaged in Styrofoam. But then, there is the rest of the country. A Federal ban will be harder, but you and I can do it. Take action. It can be as simple as tossing a can into a recycling bin.